You are currently browsing the tag archive for the ‘James Norcliffe’ tag. Confined to the Great House along with other unwanted children, Michael longs for freedom. 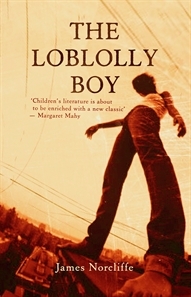 One day, an enigmatic stranger calling himself the loblolly boy offers him a chance for escape. The loblolly boy says he can teach Michael to fly, so that he can get over the wall that surrounds the Great House. But things don’t turn out quite like Michael expects. In order to fly, he needs to change places with the loblolly boy — in fact, he must become the loblolly boy. And at first he loves it — the exhilaration of flight, the freedom to go anywhere he wants and the ability to go unseen by all but a few ‘sensitives’. But he soon realises that there are disadvantages, not the least of which is an obsessive collector who wants to add a loblolly boy to his collection. It’s not long before the new loblolly boy is longing to get his old life back. The problem is how to do it. The Loblolly Boy by James Norcliffe is an entrancing, exciting, unexpected read — a kids’ book that really does have the potential for much wider appeal. Although set in the modern world, it has a wondrous, magical fairy-tale ambience. And even though the story is quite simple, I never quite knew where it was going or how it would be resolved.